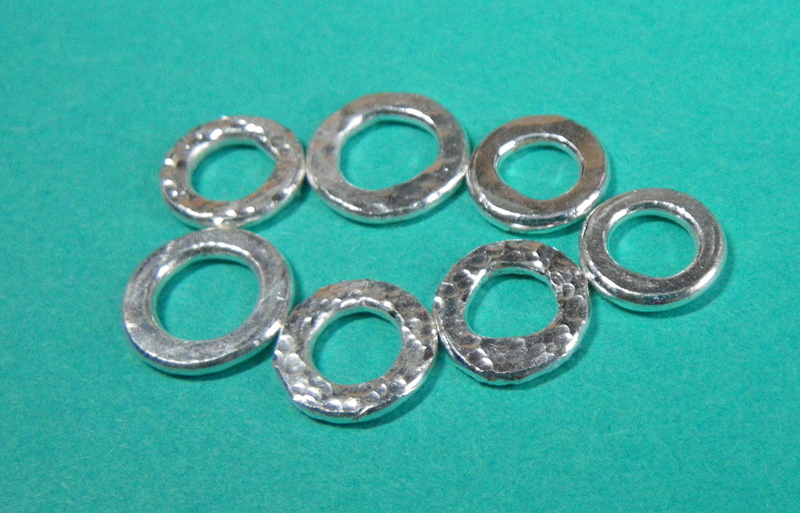 Last night I became encouraged by additional success with fusing fine silver jump rings. 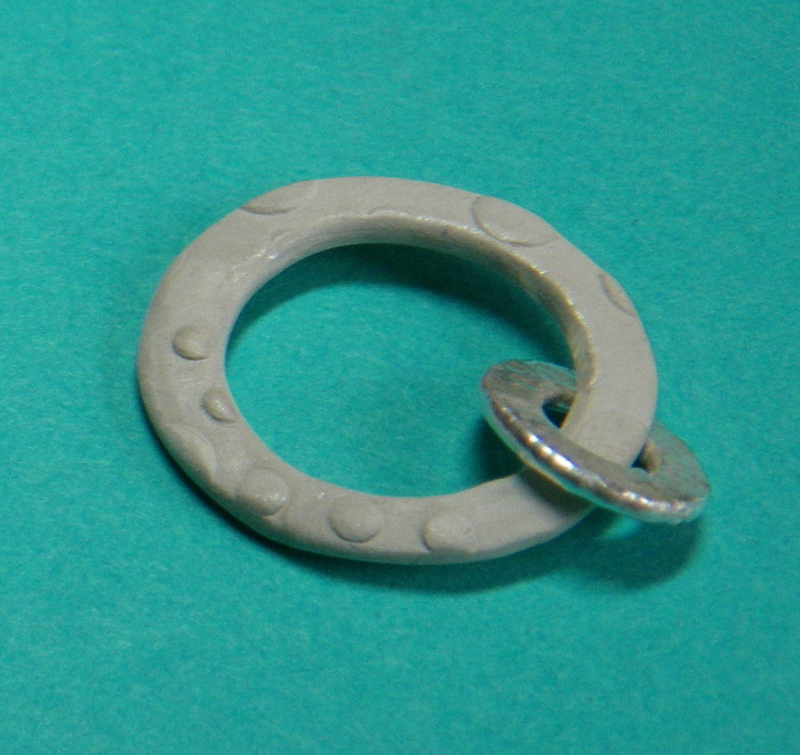 I attached one to a PMC3 oval to use as a clasp. Rather than fuse the jump ring in place, after firing the PMC clasp, I tried cutting a small wedge out of the leather hard PMC oval, placed the jump ring on, and then moistened the wedge’s edges and slid it back into place. This is a technique from Kate McKinnon’s book Structural Metal Clay that I wanted to try. So far so good, but I needed a hook for the other half of this clasp, and this is where the 14 gauge wire felt less than friendly. In trying to make a simple wire-wrapped loop with thicker wire, my pliers felt foreign. I tried to correct the curves I didn’t like, and the hook looked worse! I can make these wrapped loops in my sleep with 20 gauge wire, but I remember how frustrating it was to learn at first. What is easy now, I had to do many times, before it became that way. So I kept trying, making what looked like super-sized French ear wires, until I thought to try fusing the end loop instead of wrapping it. I went to bed last night thinking that Mr. 14 gauge and I were great friends. 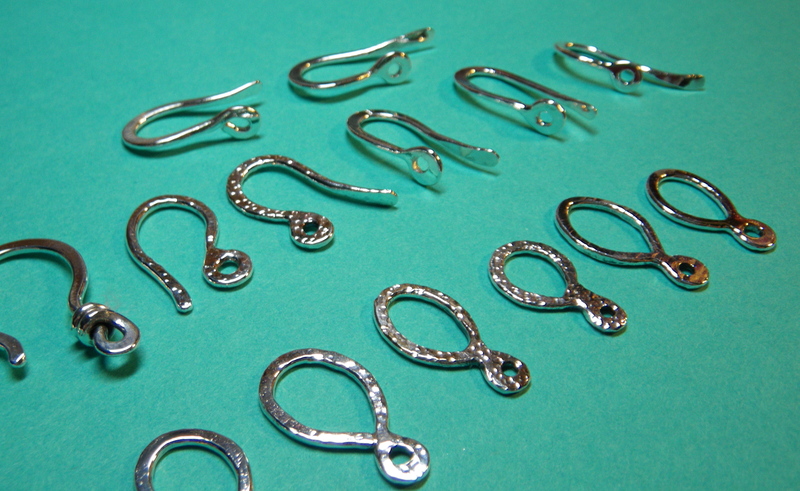 This morning I made 11 hooks to fuse, and 11 figure-8 loops to match them. I had fusing confidence as I lit my torch after lunch. 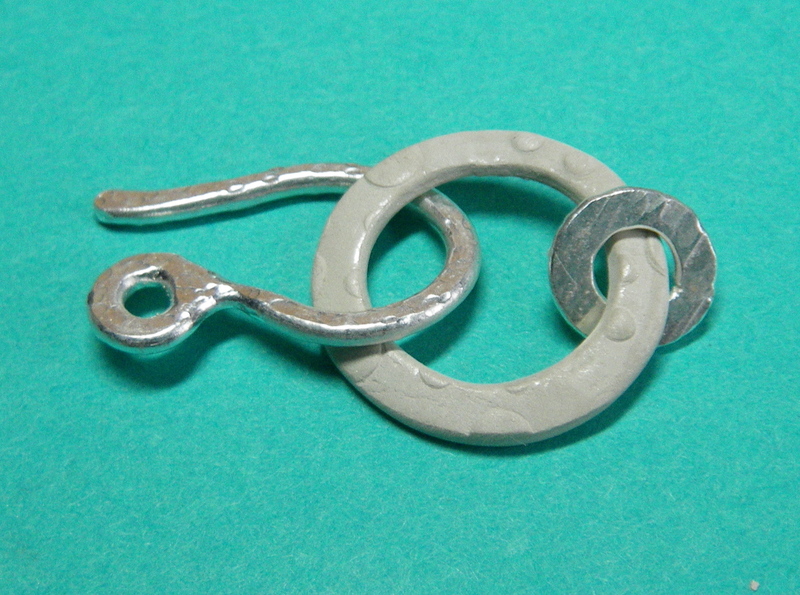 It turned out that the hook with the perfect little fused loop on the end was a nice piece of beginner’s luck. Undaunted, I knew I could drill out the spots where the wire had melted to completely fill in the smaller loop. And my work-hardened friend was once again pliant after being annealed by the heat from the fusing process. With some shaping and hammering I ended up with a few new clasps I will be happy to use. I imagine I will learn to be more comfortable in using this heavier gauge wire, and alreay I’m not in such a rush to order the 16 gauge I thought I was missing. 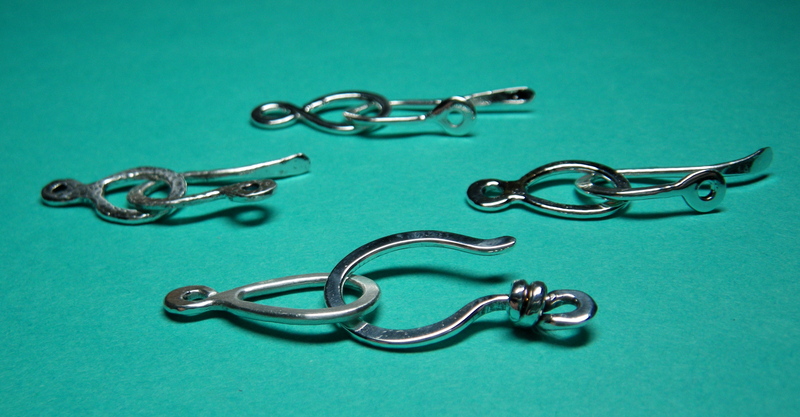 After fusing my way through these clasps, I tried a few more jump rings to have on hand. I’m happy to say they are getting a little easier each time. It has been a while since I’ve spent this much time with my torch. I keep it in my basement work room, where I also do my soldering and keep my drill press for drilling rocks. Today I picked up some fired copper clay pieces that had been sitting on this workbench since early last fall. 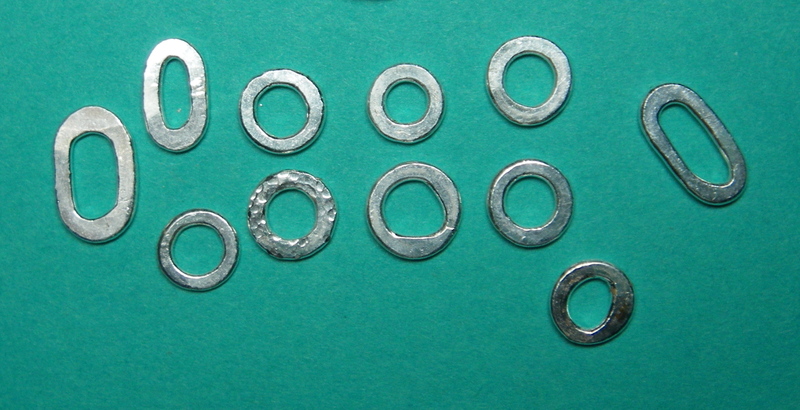 Abandoned earring components. Maybe I though they were too thin? Maybe the rest of that kiln batch had not sintered properly? I couldn’t really remember how I had planned to use them. Perhaps they just seemed too plain. I decided to take them upstairs to my studio to see what would happen if I hammered them. Would they harden, crumble, or crack? Well, they hardened quite nicely. And as I set them down on my bench, next to the rest of my work from today, darned if they didn’t become another idea for a clasp! SO impressive! even if i had a whole day, i don’t think i’d get all THAT done! now that you’re a fusing expert, i’ll run my problems by you! Ha ha. I’m still a neophyte fuser, far from expert. But I like it when we run our problems by each other!